You will need to seek permission for the use of two types of copyrighted material. Your own previously published work to which you do not hold the copyright. This is often the case with your published journal articles. The journal publisher typically owns the copyright. Another author/creator's work that doesn't fall under the principle of fair use. If the material used is in the public domain, authors are not required to seek permission. That said, if the use of the material falls outside fair use, authors should provide acknowledgment and secure written permission. Thesis and dissertation writers should consult Kenny Crews Copyright Law and Graduate Research listed in the Resources & Tools section below for a thorough discussion of their rights regarding their thesis/dissertation. Image credit: Lee, Russell, photographer. 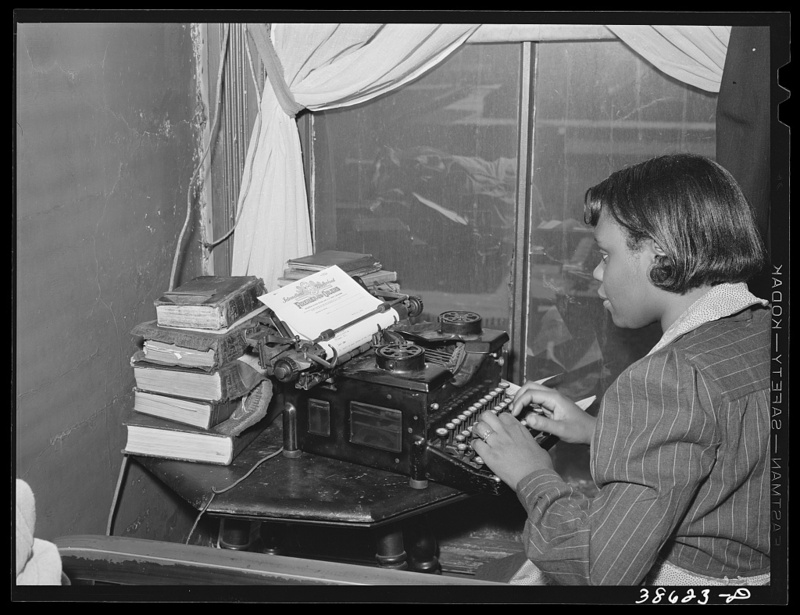 Wife of a railroad worker typing a letter. Chicago, Illinois. Chicago Chicago. Cook County Illinois United States, 1941. Apr. Photograph. https://www.loc.gov/item/2017788821/. Quoted excerpts from published materials. The principle of fair use allows for educational and/or non-commercial use of a small amount of material so long as it does not constitute the heart of the work and is genuinely needed for purposes of the use. For example, stanzas of poetry, letters, song lyrics, diary entries, and other items that constitute either the complete work or a large part of it usually require permission. The author of a letter, rather than the recipient, generally holds copyright to the letter, but permission to publish the letter will also be required from the recipient. Quoted excerpts from unpublished materials. These include unpublished letters, speeches, and papers. In cases where the work has not been previously published, users should obtain the author’s permission to publish any part of it. Quotations from archival materials. Although the archive may or may not hold copyright to the material used, users should obtain permission from the archive as holder of the material. Images, photographs, tables, charts, maps, graphs, and similar works. Users should plan to obtain permission from not only the copyright owner of the work (i.e., the creator of the work), but also from the owner of the physical object (e.g., a museum, archive, or individual). Where photographs depict private individuals in private settings, users may also need permission from those in the photo. Interviews. Depending on the circumstances, copyright to an interview may be held not only by the interviewer, but also by the interviewee. A good example of this is where the interviewee is tape recorded or recorded verbatim. In this situation, the wisest choice is to obtain permission from both the interviewer and the interviewee. Government documents and materials. Although U.S. government works (i.e., those created by a governmental officer/employee as part of his/her official duties) cannot be copyrighted, this does not mean that you can freely use any documents or materials in the government’s possession. The U.S. government may hold copyright to a work where it has been assigned by the copyright holder. This is an excellent guide to obtaining permissions for all sorts of copyrighted work, licenses, dramatic work, images, textual works and more. There is an especially helpful section on identifying who the copyright holder is.